After years of having an ugly bedroom, a while ago we finally gave our bedroom a makeover and now I love it. I had never liked our bedroom before - with the bare light bulb glaring at me from the ceiling and my chunky, dated hand-me-down bed, it just wasn’t a particularly pleasant room to go to sleep in every night. I really think making your bedroom a space you really like to be in is worth the effort. I used to have a LOT of trouble falling asleep. Even as a kid and as a teenager, it would frequently take me about two hours each night to go to sleep. I love this horse wallpaper. Image via Pinterest. I think that at different stages, it was caused by a combination of factors (like pre-bedtime overthinking (I have been called a worrywart), stress, having a home office in my bedroom, working or studying until bedtime, not having a dark enough room) but over the years I have tried loads of different things (everything from chamomile tea to pressure points) and gotten a LOT better at sleeping. And good sleep is more than about avoiding bags under your eyes, but health problems too. A recent study by the Brigham and Women's Hospital in Boston reported that sleep deficiency – whether not enough sleep and/or or poor-quality sleep - has been linked to health problems including obesity, diabetes, cardiovascular disease, and even increased risk of particular cancers and depression. A great thing you can do to help yourself get enough sleep is to make your bedroom a restful, relaxing sanctuary that you love to be in - one that helps you unwind as soon as you walk in. A pleasant bedroom can make you feel good, which in turn can help you relax and sleep better. So today here are 10 tips for how to make your bedroom a sanctuary. It sounds weird, but some researchers believe the colour of your bedroom walls can affect your sleep. According to the Daily Mail, a 2013 study by Travelodge found that the colour of your bedroom can influence how much sleep you get. 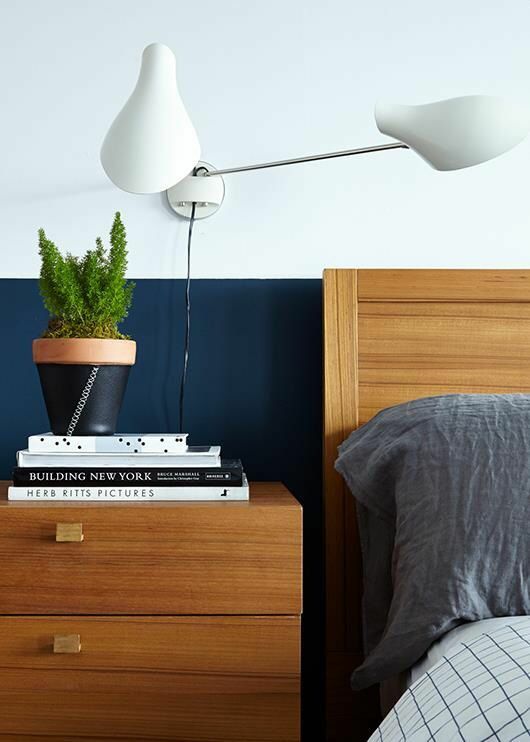 The researchers, who looked at 2000 homes across the UK, found the most restful colour for a bedroom is blue, with people in blue bedrooms getting an average of seven hours 52 minutes sleep a night. Yellow and green bedrooms also did well on the sleep test, but purple bedroom owners slept the least, with the study finding they slept on average only five hours 56 minutes a night. This was thought to be because purple is thought to stimulate the brain (and creativity!) which makes it trickier to nod off. Red and yellow were also believed to have a overly-stimulating effect in bedrooms. 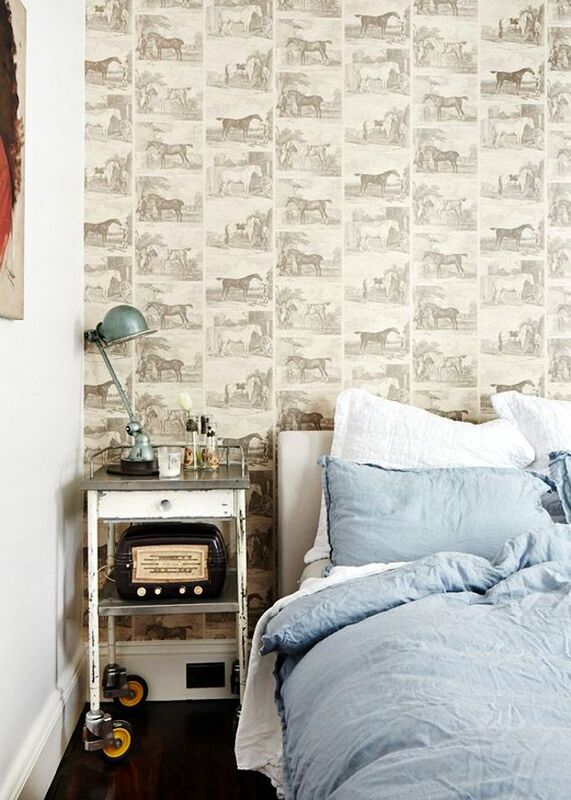 I love half-painted walls and love the inky blue in this bedroom shot from SF Girl by Bay. I have always loved bedrooms in more restful colours - whites, greys, blues, greens, soft pinks and blues. I love the colour my interior designer friend Nelly Reffet of Twinkle and Whistle recommended for our bedroom walls (Dulux Still). It's a soft grey-olive green and it gives the room such a calming, restful feel. I could never paint our bedroom red, or orange or hot pink - I think I would take even longer to fall asleep. Also, then Mr Nerd would kill me in my sleep. His-and-her bedsides and walls in Dulux Still in our bedroom makeover. 2. Add really nice lighting. Do you guys remember how I admitted Mr Nerd and I had a bare light bulb hanging from our bedroom ceiling for like three years because we couldn't/wouldn't agree on a ceiling light? God I hated that light bulb. (But you know what I hate even more than that creepy light bulb? SUBMISSION). Anyway, now the creepy light bulb is gone, and we also got Mr Nerd a beautiful bedside lamp from Freedom. The first night I turned it on, I could not believe the difference it made to our tiny bedroom. It looked so nice and cosy. Beautiful lights make your bedroom feel inviting. I think it's so worth getting a couple of bedside lamps you love. Love the bedside lighting in this bedroom on House*Tweaking blog - plus wall-mounted lights give you more space. 3. Invest in a really good bed - and get assistance to choose the best mattress for you. 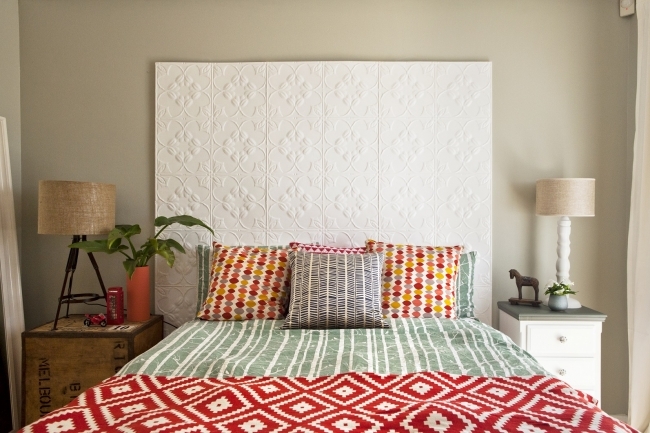 As an adult I’ve had two brand-new mattresses and as I unfortunately get niggling back and neck problems, I always think a good mattress is worth every cent! We love our new mattress so much we call it Cloud Bed - it’s the most comfortable mattress ever. Your mattress should be replaced every 8 to 10 years as after this time a mattress may have deteriorated by as much as 75% from how it was when you first bought it – and you need to have a mattress that complements your body and the way you sleep. All kinds of factors - things like your age, weight range, your favourite sleep position, whether you suffer from things like allergies, asthma, back pain or shoulder pain, whether you have a partner who jumps around in their sleep like they’re having a fit – can play a role in the best kind of mattress for you. Bed and mattress retailer Sleepmaker have a Comfort Selector on their website where you can help work out the best mattress for you – but I always think nothing beats heading in-store to try out mattresses in person. Bed shopping is so much fun! And it’s great to get expert advice and have someone run you through the best options. 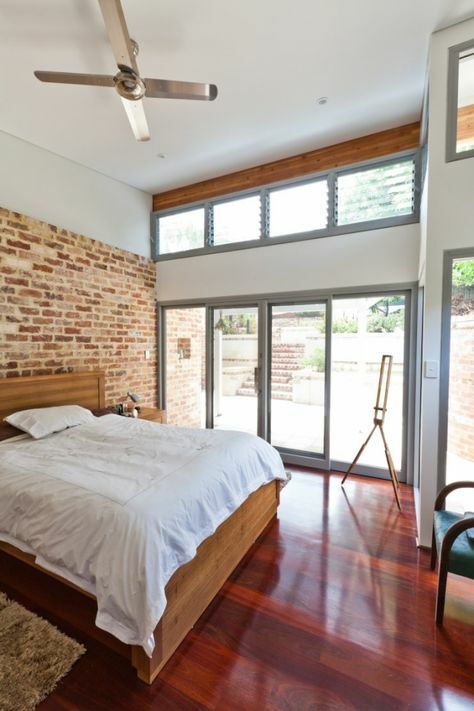 Exposed brick and jarrah floors in this Bayswater renovation I covered last year. Image by Heather Robbins of Red Images Fine Photography. 4. Decrease your screen time before bedtime. Have you ever stayed up really late on your computer, working or finishing an assignment due the next day, feeling completely brain-dead and like every sentence you write is like pulling teeth – then when you FINALLY hit your bed around 2am with glee, you find that even though you are so absolutely exhausted you just. cannot. get. to. FREAKING. SLEEP? Researchers say the light from screens in the evening – whether that be your computer, phone or iDevice - alters sleepiness and alertness and suppresses melatonin levels. Which is why you can find it so hard to sleep even though you’re absolutely mentally spent. Screen time before bed can seriously affect your ability to sleep well - it definitely does for me. Sadly, this is not me. Photo from the Daily Mail. According to new research released late last year from the Brigham and Women's Hospital in Massachusetts and published in the journal Proceedings of the National Academy of Sciences, screen time before bedtime - from eReaders, laptops, computers, smartphones and certain TVs – were detrimental to good sleep and also contributed feeling like a zombie the next day, because sufferers were less able to focus. 5. Similarly – skip the iPad in bed. For a while, I read books on an iPad in bed - but I found it made me so ‘wired’ that I would lie in bed for an hour afterward trying to sleep – which is actually when I came across the Massachusetts study just mentioned. The researchers found that study participants who read on iPads before bed (as opposed to a printed book) not only found it MUCH harder to fall asleep, they also had shorter REM sleep and secreted less melatonin, which helps regulate good sleep. So even when the iPad readers did get a full eight hours sleep, they were more fatigued and less alert the next day than participants who got the same eight hours sleep, but read printed books instead of iPads (aren’t real books always so much nicer to read anyway?) So if you want a good night’s sleep - skip the iPad in bed. Unless you’re reading my blog, in which case I give you full permission to go to town. Recent research shows reading an iPad in bed makes your brain more hyper than if you read a traditional book. 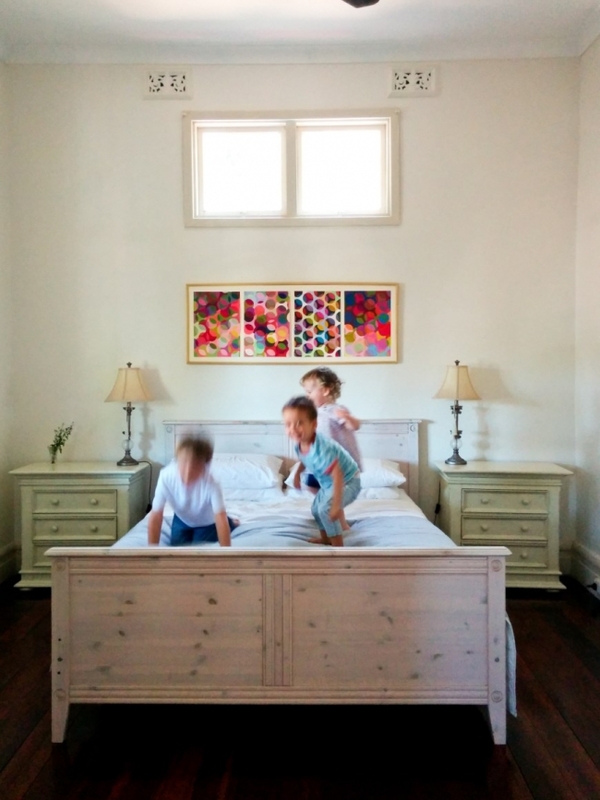 Bed jumpers from a recent Home Envy post on a little Palmyra cottage. 6. 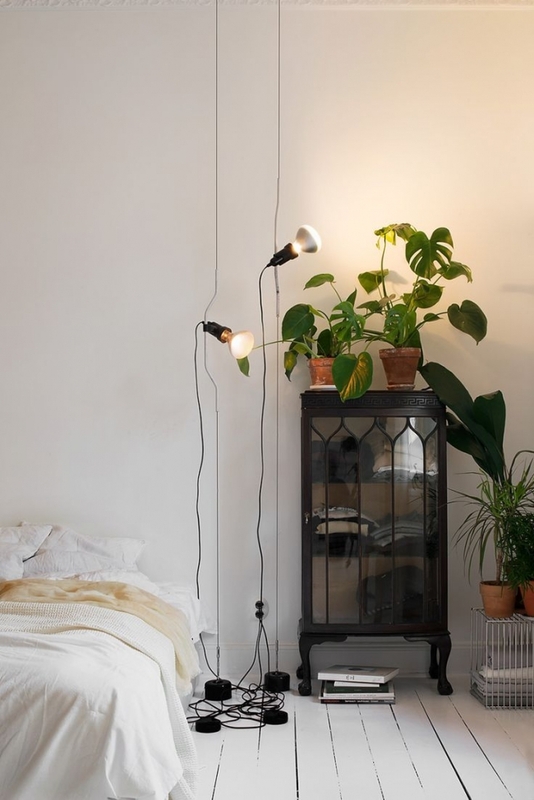 Add life to your room with an indoor plant. Yes, I do go on about indoor plants a bit! But an indoor plant is the best way to freshen up your room in a heartbeat - and a much less time-consuming version of giving a room a lift with new paint. A plant instantly adds life, purifies the air and brightens and freshens a room up. I also think an indoor plant makes your home look slightly impressive and loved, because it clearly shows you can look after something and keep it alive (well it does if your plant isn't dead). The home of Thomas Lingsell on A Merry Mishap blog. My fave indoor plant picks - fiddle leaf figs, because their leaves are just so structural and pretty, pothos, because it's such a cute retro-style trailing plant, snake plants because they live on neglect, succulents, because they have that small, cute thing going on, century plants, because they are so structural and look so cool and cos you can probably steal one from your neighbour's '70s house, and ZZ plants, which are great for low-light bedrooms as they don't need a lot of sunlight. Or water, or care, or anything at all really. I abuse mine and he's still thriving. 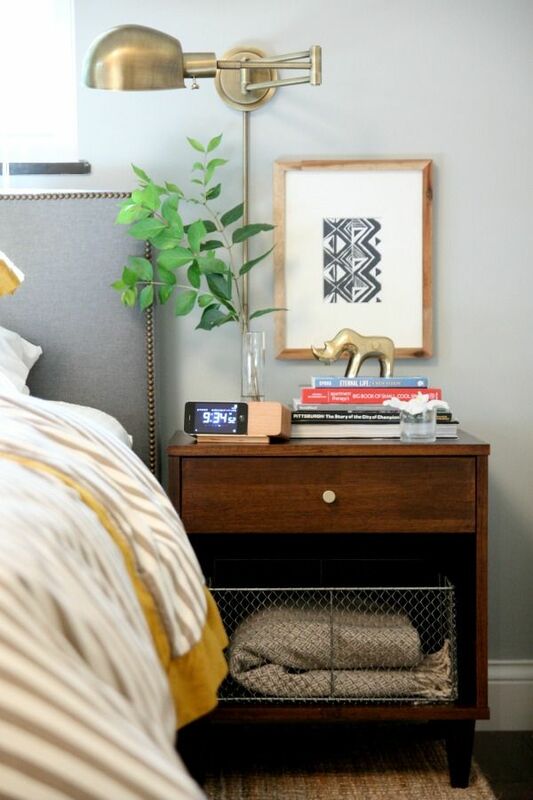 A snake tongue or mother-in-law's tongue in this beautifully uncluttered bedroom from The Family Home project at The Beetle Shack blog. Love this house. Photo by Emily Beetleshack. 7. Invest in really beautiful bedding. We recently got some Mulberry Threads blankets bamboo sheets. Oh, my god. It brought to mind the last time Mr Nerd and I stayed in Melbourne in this beautiful hotel apartment with this king-size bed and the softest, smoothest sheets I'd ever touched. Now I get that 'feeling blissful in a hotel' happiness every time I go to bed at home. Really good sheets are one of the best ways to make going to bed feel like luxury. 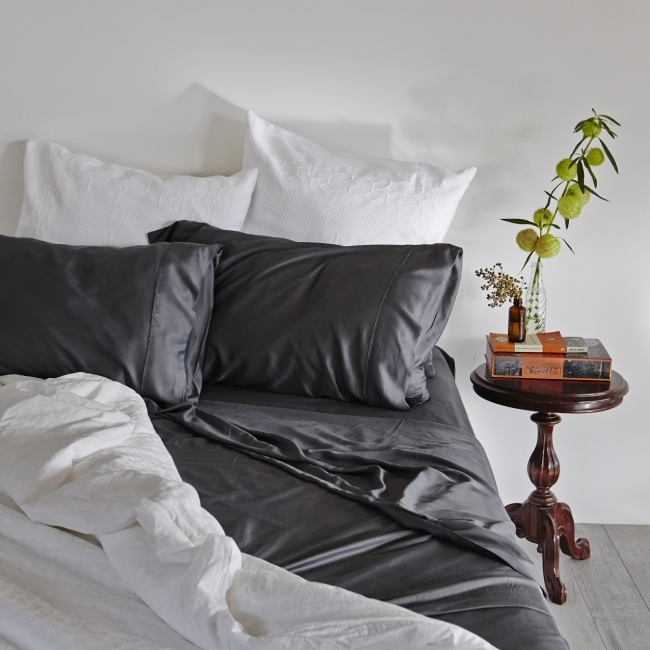 A lushly made bed with charcoal bamboo sheets from Mulberry Threads. 8. Get into a regular sleep schedule. Getting in sync with your circadian rhythm - your body's natural sleep-wake cycle - is one of the best things you can do to get a good night's rest. When you keep to a regular sleep schedule, going to sleep and waking at the same time each day, you feel more energised than if you slept that same amount but at different times. You’ll know if you're getting enough sleep because you should wake up naturally around the same time each morning without an alarm. (Ever woken up just before your alarm goes off every morning? That could be your body getting into a good sleep rhythm). Sleep experts advise trying to go to bed at the same time every night and waking at the same time each morning. 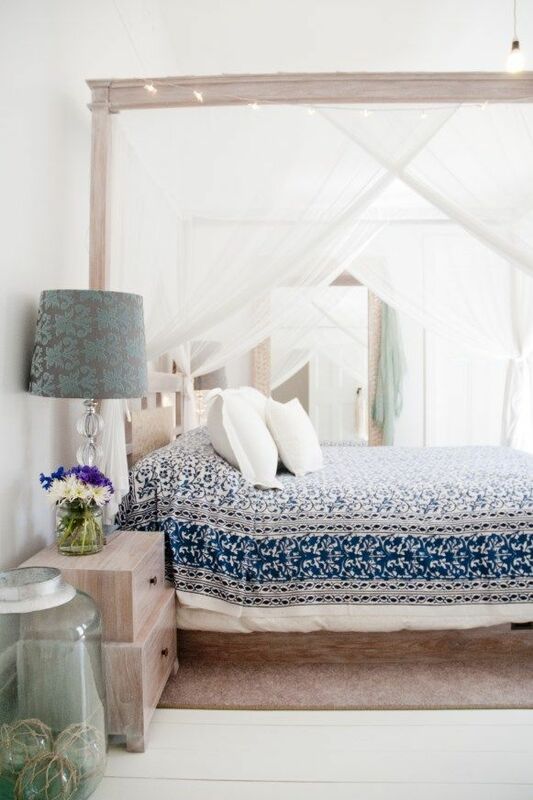 An airy, calming bedroom in this East Fremantle cottage I once featured; home of Vanessa Fordham and Karl Cramond of Villa Kula. Photo by Meghan Plowman of The Orchard. 9. Eliminate clutter, distractions and technological equipment from your bedroom. Making your bedroom a neat, clutter-free space will have wonders on your ability to unwind in there. I find that clutter is always an energy drain and a source of annoyance (bare ceiling bulb, anyone?) So if you're going to bed and you're annoyed about that pile of junk in the corner of your room you still need to sort through - just get it done! Achieving a clutter-free bedroom will help you feel more organised and helps create a peaceful state of mind. Same goes for things that are unfinished, broken or need replacing. 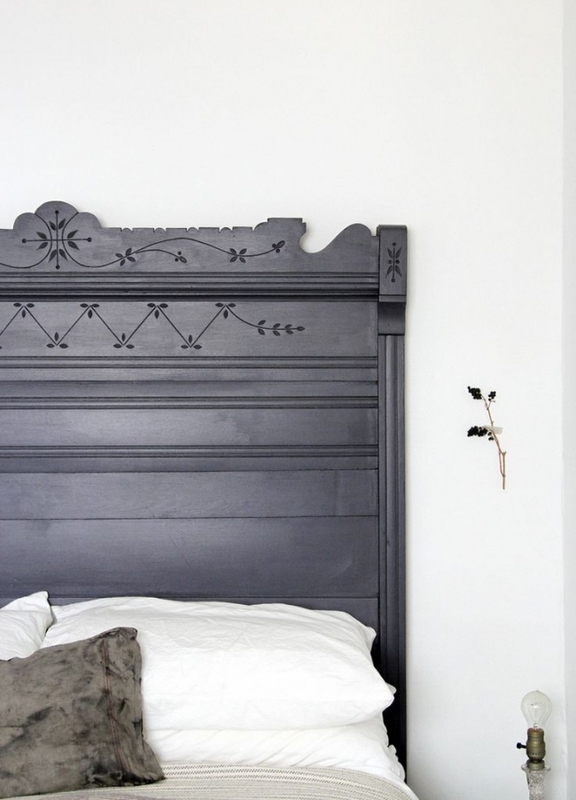 I love this painted wood bedhead from The Poetry of Material Things. And if you struggle to fall asleep, it is a good idea to move any technological equipment like your TV or computer out of your bedroom. I would never have a TV or a computer in my bedroom ever again. When I lived at home I freelanced and I had a small home office in the corner of my bedroom. I also had a big TV directly opposite my bed (which I loved until I saw The Ring). But having a home office in my room definitely affected my ability to fall asleep - and I didn't even realise how much until I went away travelling and then later moved out of home, where I had the space for a separate home office. Research shows having electronic equipment like a computer in your bedroom (yes, even when it's switched off) can affect your sleep as they emit electromagnetic frequencies (EMFs) that suppress melatonin production. Over the long term, suppressed melatonin production can contribute to health problems, so it's best to keep computers and TVs out of the bedroom if you possibly can. 10. Finally, get a pillow that you love the crap out of. Ever slept on a crappy pillow and woken up the next morning with a sore, tight neck? I’m not sure how my dad does it – because he sleeps on the oldest, toughest down pillows I’ve ever seen. I remember when I was a kid I used to punch his pillows for fun, because it would leave a perfect fist-shaped indentation, knuckle outlines and all. Every time we brought up him getting a new pillow my dad insisted he liked them lumpy. We stopped annoying him about his rock-like pillows. I figured if we ever had an intruder, he could knock them out in a pillow fight. 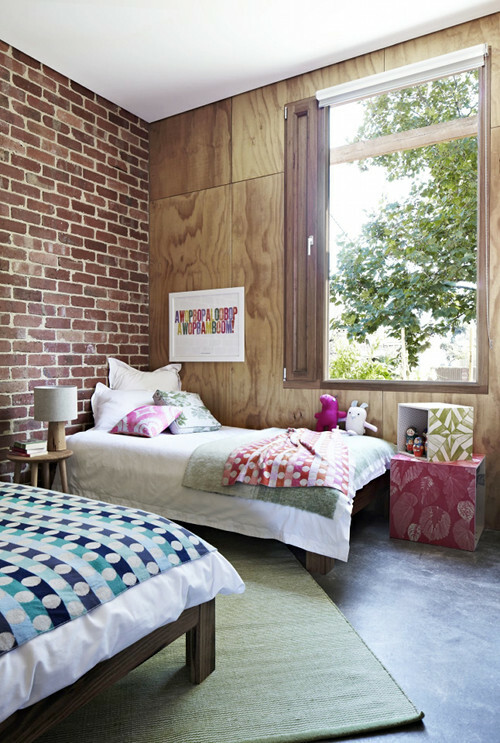 I love the mix of ply and brick in this sweet Melbourne house from Design Sponge. One day I came home after buying a new mattress and a new pillow and Dad nearly fell off his chair when I told him the pillow cost $100. But since that day, I have maintained that a really good pillow is worth spending the money on - especially if you get constant neck and back problems, like I unfortunately do from a combination of scoliosis and a predominantly computer-focused job. A good supportive pillow helps so much. If you're not sure what the best kind of pillow for your needs would be, talk to an expert at a bed shop – and let them know if you get any niggling back or neck aches or pains or if you suffer from asthma or any allergies. 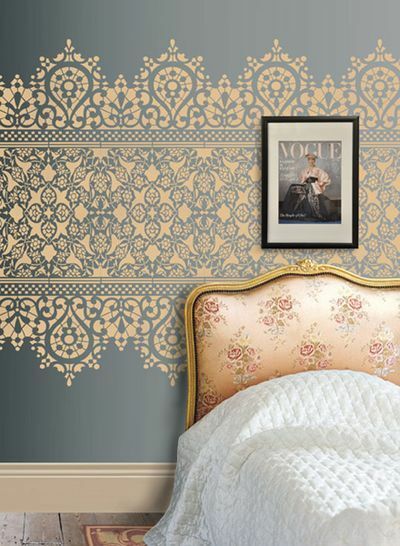 How beautiful is this lace stencil idea? From Design Inspiration. I read the stuff about certain colours having overly stimulating effect etc. as well, but I really don't get it. I mean, what difference does the colour of your bedroom make when at night, it's almost pitch dark in there? At least in my bedroom, that's how it is. The window faces my backyard (basically two depths' of backyards - my street's and the street's behind us) and I have curtains that block light pretty well. My bedroom is off-white - a really pretty hue from Benjamin Moore (I think it's called Dove Wing but I am not 100% certain) and I love how at night, with table lamp turned on, the walls take on this almost velvety or suede-y feel. The other day, I looked at the can with the leftover paint and I found out, to my own surprise, that I painted the bedroom 6 years ago. (Normally, I paint as if my life depended on it and I change the colours pretty much every year or 2 years max). I guess it attests to my love with the colour. I am not planning to change it any time soon. I stick highly to the colour theory. I think seeing a colour before bed can rev you up or calm you down. This morning I told Mr Nerd how once I was studying for an exam and wore red pyjamas to bed that night for the first time.... and did not sleep a blink ALL NIGHT. I just lay in bed eyes open and I blame the red pyjamas. Mr Nerd rolled his eyes and was all, "It wasn't the pyjamas, clearly you were worried about the exam" but I honestly wasn't in the slightest... it was worth like nothing of my final grade, I felt like I would do well and I got 100%.... it was the RED PYJAMAS I tell you. Keeping me awake. (I went home and fell straight asleep). Your bedroom sounds beautiful. Benjamin Moore make lovely paint shades and Dove Wing sounds as pretty as it must look! Sounds like you picked a paint winner - I'd very happily leave it too. I am in the process of making my bedroom a sanctuary. I have an ombre soft blue doona cover, new white simple theme and changed the layout of my room so that I now look out the window and see the garden. I added a fern, making my own macrame hanger. I am in love with it now! A little more to do, but its such an improvement!! :) Your room is divine, I love your combination of colours, the different bedsides and the layers! Absolutely no electronic gizmos in the bedroom has always been my rule in our house, that includes tv ( much to our teenagers disgust) Linen bedding is my latest addiction but I am going to have a look at the bamboo bedding now you have mentioned it. Love your bedhead and we can't agree on weather to have a fan and ceiling light or fan and bedsides or fan light combo ( yuck!) but we only use main lights in kitchen and bathroom, laundry, all other rooms are lit by lamps so only having bedside lights is easy for us. aarrrgghhh!! It's only taken 7yrs to NEARLY finish our bathroom renovation so I guess another few yrs of thinking about light/fan fittings for the bedrooms is on the cards. 100% agree!!! I started to sleep better the moment I didn't have a TV or computer in my room. I don't even like to answer text messages or look at my iPhone before bedtime any more unless I absolutely have to, I now just leave answering texts until the morning. It's nice too, to 'switch off' from technology as much as I can before bed. Not a fan of the fan-light combo... (get it?? sorry) but I do like the look of a fan in a bedroom. And hey like you said, you have a few years to think about it! :) No time like the future. I love my linen bedding too but the bamboo sheets have been divine! Some very interesting points Maya with some beautiful and inspiring photos. Phil had trouble sleeping in our old bedroom which was a deep heritage pink , for want of a better description ( with floral wallpaper friezes to match). We hated it. There was hardly any natural light in the room which for him was suitable as light kept him awake. Well!! Our new bedroom has windows galore, no curtains and is white with a brick wall for the bed head (oh yes, there's the pic! Thanks! ). The worry was whether he could sleep with THAT much light? He loves it! I guess we've proved your theory! Creating his own sanctuary was the trick!! It sounds really odd, but the thing that made our bedroom more functional - and more relaxing for each of us - was having separate dressers. We can now organise and access our clothes without getting in each other's way (or arguing about who gets the big drawer at the bottom). And I can decorate my dresser with my lovely things, while his less-than-pretty things adorn his dresser. We can exist side by side without needing to negotiate around each other, or submit to the other's whims (we are not good at giving in either). Next up, that blasted bare light globe... At least we can agree on that, we just have to save up for what we want! In the spirit of redoing our bedroom, my husband and I believe it's time to get a new mattress. I like the suggestion of looking for a mattress that complements my body, and I didn't know there were so many factors that goes into it, like age, weight, and sleeping position. I'd like to suggest that when going into shop for a mattress to have a few brands in mind, so you can have some sort of starting point to help with speeding up the process. Thanks for all the help! Obsessed With: Moochie Lou - with Giveaway!